--LeAnne Walters, Co-Founder of Water You Fighting For? We knew things were bad when water coming out of the kitchen taps in our homes in Flint, Michigan, looked like frying oil and smelled like an open sewer. We're not water experts; we're moms. But thanks to the blood, sweat, and tears of regular citizens, we learned our drinking water was contaminated with lead, a fact that our city and state governments refused to acknowledge for far too long. Flint has a notorious history of being devastated by the decline of the U.S. automotive industry, economic hard times, and our corrupt government. However, Flint also has a rich history of fighters, and was ground zero for labor, housing, and civil rights movements. So when faced with the lead-contaminated water crisis, we knew we had to stand up and make our voices heard. Lead began leaching into our water system when Flint switched its water source to the Flint River in 2014 as a cost-saving measure. 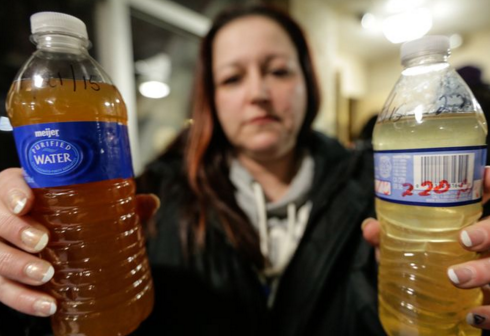 Although Flint is a proud American city, we do not live in a functioning democracy. That's because when Michigan Governor Rick Snyder declared a "financial emergency" in Flint in 2011, he installed an unelected emergency manager, accountable to the governor alone, to cut costs. Instead of working to advance the public good for Flint, the emergency manager's primary focus was on the bottom line. In the attempt to save a mere $5 million by switching to a less-expensive water source, our city's water infrastructure was destroyed; estimates are that it will require as much as $1.5 billion to repair. 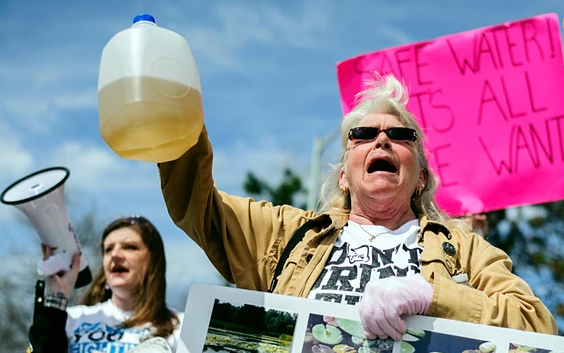 Poison traveled through lead pipes into the homes of 100,000 residents, who were paying eight times the national average for water that also delivered irreversible harm. The government denied that there was a lead problem with the water, but testing proved this crisis was real. Frustrated by the lack of progress, we went door to door to encourage citizens to get their water tested and to go to their doctors. We spent weeks coordinating citizen scientist testing through Virginia Tech and returned 277 completed test kits ourselves; those tests confirmed the lead problem was widespread and even worse than we had imagined. We all know there is no safe lead level for our children. When a local pediatrician investigated children's blood lead levels, she found that lead levels had doubled and tripled in some areas since the switch to Flint River water. One of us found that the lead in her home's tap water was considered two times the level of hazardous waste. Ongoing investigations and leaked memos show the City of Flint and State of Michigan officials were aware of serious lead contamination in some residents' tap water for months before they took action to address the problem or inform the public that the water wasn't safe to drink. The spokesman for the state's Department of Environmental Quality actually said "...anyone who is concerned about lead in drinking water can relax." Thankfully, we ignored him and kept fighting for clean water. We've been told Flint citizens would still be drinking lead-contaminated water if we had listened to City and State officials who maintained that the water was safe. Instead, we did everything we could think to do to prove our water was toxic and that our corrupt government poisoned an entire city to save a few bucks. Together we founded an organization, Water You Fighting For, to share all our research. We protested, marched, rallied, held educational meetings, spoke with elected officials, petitioned for change, joined a lawsuit for safe water, and attended countless meetings to let them know that we wouldn't be silenced. We're quite proud to be part of what all the citizens of Flint have accomplished. Our community pulled together and fought to get the water switched back to a safe source, organized water filter and clean water donations, put a democratically-elected Mayor into office, got the Governor to declare a state of emergency, and raised such a ruckus that the Department of Justice is investigating the whole matter. Safe drinking water is a basic right, which should be available whether you're rich or poor or whatever your race. Both of us remain committed to securing safe water for everyone, and to obtaining justice for the children of Flint, who will never see their full potential because democracy was surrendered for the sake of a balance sheet. --Melissa Mays, Co-Founder of Water You Fighting For? 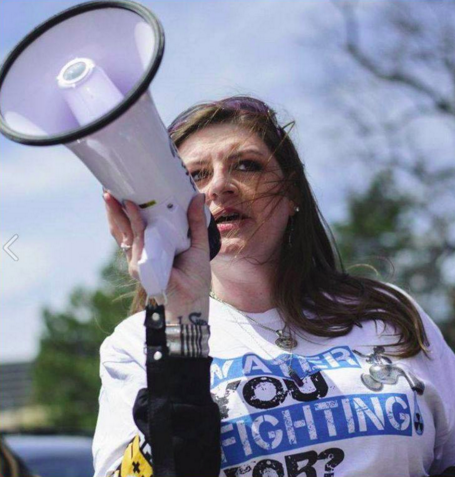 --Melissa Mays and LeeAnne Walters, co-founders of Water You Fighting For?, an organization fighting to ensure that everyone in Flint has access to clean, safe, affordable water. LeeAnne has five children and has lived in Flint for nearly 5 years. Melissa has three sons and has lived in Flint since 2002.